Join us for a tandem flight near Kuala Lumpur with one of our licensed and insured pilots. We fly 30 minutes from Kuala Lumpur at Bukit Jugra or Kuala Kubu Bharu. We choose the best location a few days prior to the scheduled flight based on the weather conditions. You can book for any day or time (during daylight hours) you like. Directions, other activities, and all other details are listed below. Price: 240 MYR or 58 USD for the flight and video (bring your own micro SD card). Deposit: A $10.00 (40 MYR) deposit is required for the reservation. 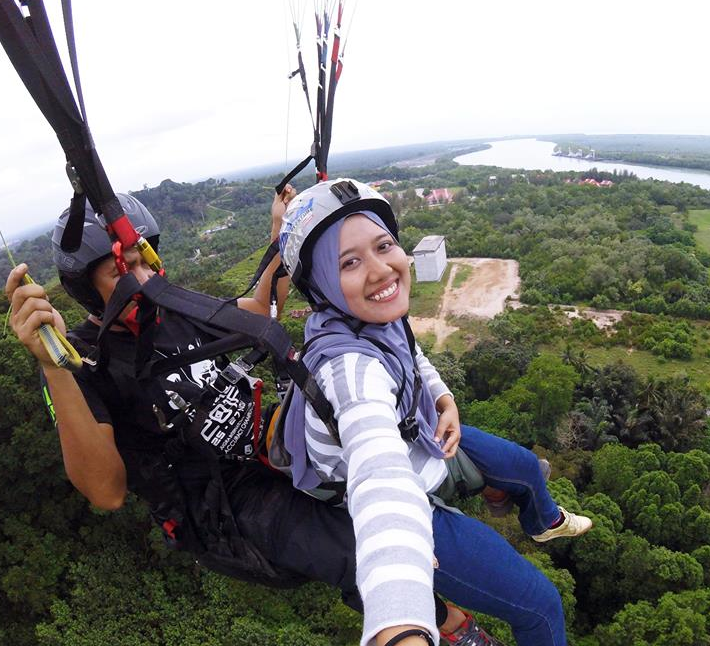 The remaining 200 MYR can be paid at the paragliding site. *Please pay the remaining balance in cash at the paragliding site. *We speak English as well as Malay. There is no special clothing that needs to be worn for paragliding, but we recommend long pants and proper shoes. Please no sandals or high heels. What is the height and weight limit? There is no height limit, but the your weight needs to be between 20-110 kilograms. Typically flight times are 10-15 minutes. We always try to give people the longest flight we can. If the weather is good, it's not uncommon to have flights of over 30 minutes. From driving up the mountain to flying to the landing zone usually takes about an hour. What if the flight needs to be cancelled? If the flight needs to be cancelled due to strong wind or rain, then you will be informed two days prior to your scheduled flight via email. Please be sure to check for this. We are always keeping a close watch on the forecast, however, cancellations do happen. We can reschedule your flight, or you can choose to receive a full refund of your deposit within 2-3 business days. ​What is the best season to fly? We fly all year. Spring, Summer, Fall, and Winter are all great times to fly. There is no age limit. Anyone with an interest in paragliding with us can fly. If you are under the age of 18, we will need consent from a parent or guardian. Statistically paragliding is no more dangerous than driving a car. All of our pilots have many years of flying experience, and all of their equipment is regularly inspected. Do I need to purchase special insurance? All of our pilots are insured already. This means if any sort of injury did occur, your pilots paragliding insurance would cover the cost of any injury to you. Sure why not? More photos to enjoy the experience would be great. Your pilot will have a GoPro camera for you to hold during your flight. After the flight, you can choose to purchase the video from the pilot. The weather is very important to paragliding. Safety is our first priority, so we will be checking the weather regularly. We will notify customers at least 2 days prior to the scheduled flight if cancellations need to be made. Price: 240 MYR. The video is included in this price. Please be sure to bring a micro SD card. Deposit: The deposit is $10.00 or 40 MYR. Please pay the remaining 200 MYR at the paragliding site. The video is included in the price, but you will need to purchase your own micro SD card and bring it to the paragliding site. These can be bought at most convenient stores, phone stores, or electronic stores. A photo of this card is shown here. Other outdoor adventure sports coming soon. You can reserve a tandem flight with us for any day or time (as long as the sun is up). The meetup location is Bukit Jugra or Kuala Kubu Bharu. Send us a message when you arrive and we will meet you. Allow about 2 hours to assess the weather, go up the mountain, takeoff, land, and arrive back at the meetup location. By Taxi: By far the easiest way to go to the paragliding location is to take a taxi. The price is around 15 USD or 60 MYR. The address of the paragliding sites are shown below the map. Message us when you arrive and we will pick you up and take you up the mountain. We can also be reached via WhatsApp or Wechat. Please be flexible, as there are sometimes delays due to the weather conditions. Flights are generally 10-15 minutes long. We fly at two possible locations based on the weather conditions. This is to ensure we have longer safer flights.